Marijuana growing is not merely burying a seed in the soil, watering it every now and then, and letting the sun do its job. It requires knowledge, precision as well as a lot of patience, too. That’s why growers who are only starting their journey find all the processes overwhelming. Sometimes, reading alone is not enough. Lucky for GetbackJoJo, he has the whole I Love Growing Marijuana (ILGM)’s family of growers behind him. This grow journal has been fairly easy for him because his answers and confusions were easily put to rest. Autoflowering seeds are a usual first choice for beginners. They do not require as much attention as photoperiod seeds. Plants that grow from autos, as they are popularly known, do not rely on light schedules to flower. Also, while they yield a little bit lower than usual, their flowering periods are shorter. For GetbackJoJo’s he went with White Widow Autos. White Widow is a strain that has been gracing Dutch coffee shop since the early 1990s. Usually, its buds are crystal white laden, as if a warning of what is to come. In an instant, smokers may feel a burst of euphoria and energy. Most of the time, it gives them a creative high. Four White Widow Autos arrived on GetbackJoJo’s doorstep today. Like an excited little kitten, he immediately dropped them in cups filled with water pH’d to 6.5. This lucky lad had a four out of four success in germinating the seeds. He then transferred them into 4-inch peat pots filled with Fox Farm Happy Frog Potting soil. As for the heating mat, he sandwiched it in between two catering pans so the seedlings would not be directly affected by it. For the final touches, he misted the soil with pH 6.5 water. Before saying goodnight, GetbackJoJo covered the pans with a large plastic container. He did make sure to leave some space for fresh air to flow through. Vipar Spectra V300 has been installed and running. With it inside the tent, while the temperature remained almost the same, the humidity rose up a notch. Humidity that high does not call for any water for the seedling, so GetbackJoJo is going to leave it as is for now. Like a child was born, GetbackJoJo is excited to announce that his quadruplets are all out of their shells. Then, he gave the girls a quick misting. And, GetbackJoJo also plans to change the light schedule from 24 hours on and 0 hours off to 18 hours on and 6 hours off. To prepare, he raised the Vipar Spectra V300 to 30” from the sprouts. Before going to work, GetbackJoJo had a heart-to-heart talk with his wife. She was firm on not wanting the White Widows in the garage where they are right now. He had no choice but to move two of them to the greenhouse. The other one went in a different grow tent and the other one did not make it. At once, GetbackJoJo transplanted them into 7-gallon fabric pots. He filled these with 1/3 Fox Farm Happy Frog Potting Soil and 2/3 with Fox Farm Ocean Forest at the bottom. Other plants like tomato plants, dill, basil, etc. are going to keep these two White Widows company. As soon as he got home, he was expecting them to be so dry. The temperature in his are hit an all-time high at 97°F. However, they did not disappoint their grower. Both girls have their first set of leaves emerging in a deep dark green shade. Maybe starting them in a hot garage really did the trick. One week in and these girls are looking amazing. Other growers agreed and are worried that keeping the pots in the soil with the plants would get them root-bound. GetbackJoJo happily obliged with the suggestion. He was surprised to see that the plants are in fact, have roots building their way up from the bottom of the pot. Bob31 did assure him that this is not something to be concerned about. It would take the roots at least a week to expand and would slow down in the process. First thing he did this morning was water the White Widow Autos with rain water pH’d to 6.5 until run off. He expects it to last them at least three days because the temperature is supposed to increase to mid-80s and there is a chance of 30 to 40% rain every day. Both girls are more than two weeks old already. However, GetbackJoJo is still worried because their stems are thinner than usual. Even though they still do hold the plants up nicely, they are fragile and look like they can give up any moment. As Bob31 suggests, even a small clip-on fan to twitch the plants’ tops can do the trick. Fans are usually do the job not only in thickening the stems, but strengthening them as well. They are not peppermints by the way, they’re just signs to mess with anyone who sees them. At barely three weeks old, he is amazed to see more sets of leaves coming in. As of the moment, the 4th and 5th sets are already making their way in for the bigger White Widow and the smaller one is already at her 4th. Though there are some leaves turning up yellow and he takes it as a sign to start with the nutrients. Today marks their third week since sprouting. The bigger girl (White Widow Auto) is already standing tall at 6”. 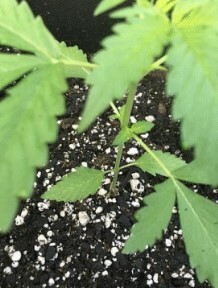 She has all sets of leaves connected to the main stalk. This has GetbackJoJo thinking whether it’s the best time to give her some LST (low stress training). Four days after their first feeding, and they seem to be responding well to it. New growth keeps sprouting everywhere. Almost a month since sprouting, he got his first pistil sighting today. These girls are ready to flower. Since the last nutrient feeding, there were some signs of nutrient burns. Since then, GetbackJoJo has been giving them nothing but water pH’d to 6.5. Nonetheless, they had a significant growth over the past 10 days. The pistils are much more noticeable since the last time. They are officially flowering so he figured it would be best to give them Fox Farm Big Bloom from Fox Farm next week. He has to fatten these buds really quick. GetbackJoJo’s neighbors are getting suspicious of his grow. They are insisting to look inside the greenhouse. He had to move the girls inside his home again in a grow tent. Then, he made the Mars Hydro LED lights in the tent work for the ladies. Now that there are people who are doubtful of what plants he really is growing, he had to get the carbon filter working. As soon as he sets the White Widow Autos down, the smell of it got so overwhelming. They also went back into the sun today. Maybe he does not care about the nosy neighbors anymore. Buds are definitely there as it is already forming. 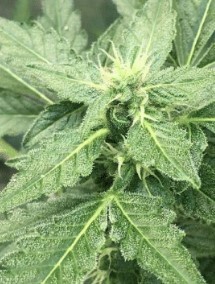 Colas are also developing with frosty leaves. These girls just hit their 7th week today, if his calculations are correct there are only three to four weeks left with his grow. He also upgraded the recommended dosage to 3/4 instead of the usual half. The White Widow Autos are still eating and drinking only twice a week. Using 7-gallon smart pots have been ideal for GetbackJoJo because they do not require that much watering. They do not dry out easily as 5-gallon smart pots. The buds are looking tasty and sticky as ever. 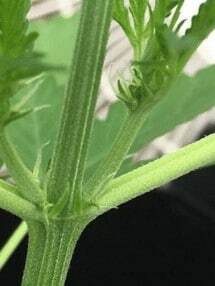 The trichomes are still a little milky and white, no ambers can be sighted as of now. Spoke too soon. While the trichomes are still pretty cloudy, ambers are starting to appear. He had also cut some of the lower leaves, laid them on a sheet pan to dry. After, he relaxed with a good smoke. With the temperature going down 10 to 15°, the ladies seem to be loving it. They look healthier and has been fattening up better than before. As GetbackJoJo was checking the girls this morning, he touched one of the leaves. Best believe that it is sticky with its smell lingering for hours. The “Last Two Weeks” countdown begins today. He’s thinking of cutting it down on the 16th. The flushing also began today with rain water pH’s to 6.5. Oh well, he had an early taste of the bud itself today. One fell off as he was trimming the bottom leaves a couple of days ago, now he’s having a good smoke with it. Growing marijuana really comes with a lot of surprises. The girls went down today. All in all, he got a total of 150 grams of wet weight. Not bad for a first-time cannabis grower. After complete drying and curing, GetbackJoJo ended up with a little over 1 oz. of buds to smoke. He gave a couple of buds to a friend, and claimed to have given his buddy a creative high. Asked questions. When something seems confusing, he utilized the community by asking questions as soon as they pop into his head. Lucky for him, growers are quick on their feet to answer. Trusted his instincts. Take LST for example, he thought it was already time to train the ladies. After assessing the situation, he knew otherwise. Had fun. With his nosy neighbors, it’s hard to actually be proud of the White Widow Autos. However, having to hide from all of them gave him additional thrill to this journey.